If you have been reading the blog you know my wide drum sander has been on the fritz. I discovered the motor turning the drum would run so I narrowed the problem down to the switch and pc board that control both motors running at the same time. Fortunately I found a place that sold parts and $50 later and a weeks time, and I had parts in hand. Saturday I installed the parts, First I tried to open the switchbox to replace them. I discovered there were screws holding it on that were blocked by the frame of the large motor mount. In order to get to them I had to remove the feed belt assembly which is held in by 4 allen bolts. I tried to get an allen wrench in to remove them but the last two are actually under the drum assembly. I had to go to Lowes and by a set of allen wrench sockets so that I could get in there to remove them. The screws were 6MM heads ao I ended up buying a metric set for $23. Well, I got the feed belt assembly off and disassembled the switchbox, I mounted the new parts in and turned it on. I should have been able to get the feed belt motor running but nothing happened. I have checked everything and all connectons are fine. I am really disgusted by the whole thing. I don’t know what to do. No one around here fixes these anymore. The last time it was in for repair the place was nearly an hour away and took 6 months to get it back. I finally got out to throw boomerangs again. It’s a beautiful fall day with the sin shining and the temperature holding around 50 degrees. 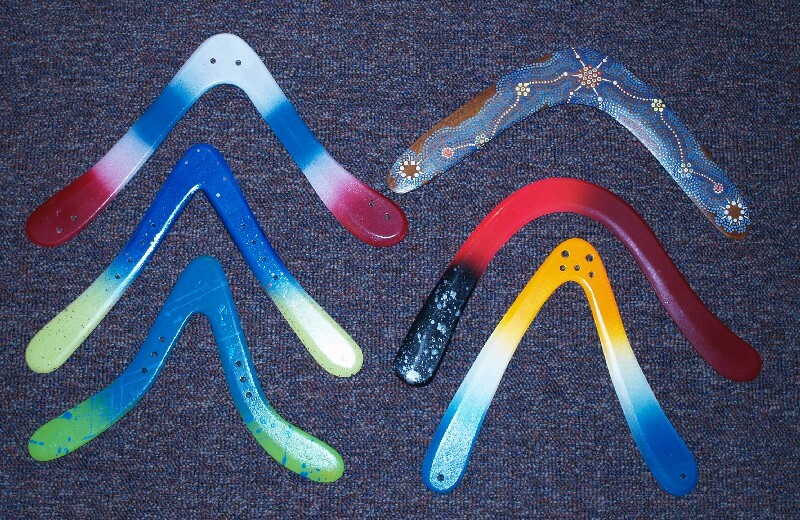 I received a bunch of boomerangs from Miguel Tissieres in Argentina. Miguel makes very fine boomerangs from South American plywoods. In this groups I received the Argus, Eclipse, Equinoccio, and Tango Twist all from guatambú plywood, the Classic a traditional two-blade, built in cedar plywood and a Big Al Hook in 4.4 mm kiri plywood. Almost everything flew great. I did have trouble with the Eclipse, which I then noticed the dingle arm was warped down.. I tried to field tune it to no avail so I will take it home and heat tune it. The real winner of the group was the Big Al Hook. It had excellent range, 40-45 meters and came sailing in for a bull’s eye on the very first throw. I actually blew the catch. It was coming in “the back door” and I turned and stepped back to catch it only to have it pop over me and land where I threw it. Another boomerang I tested is a new shape from Leonilson Junior in Brazil. He sent me some plas to cut out polycarb blanks for him. Well one shape which he modified from a Kirra, was particularly nice so I cut and shaped an extra for me. I was really liking this new boomerang, throwing it over an over again. Maybe Leo will allow me to make some for sale here. It’s a great 40 meter boomerang that probably could be weighted for more distance. Great idea Leo! I also tried 2 Dollar Store boomerangs. These are called BeeBacks and come in traditional and triblade shapes with whistles built in. If you see these in a store, do not pass go, turn around and run away as fast as possible. These are crap! The instructions molded into the underside show proper boomerang throwing instructions. That would be great if these indeed were boomerangs. I threw the triblade and it whistled nicely. However the boomerang went out about thirty feet and flipped upside down before crashing. I tried the traditional with the same results. Then I tried throwing it with 90 degrees layover from vertical, or as horizontal as possible. I have never seen a boomerang do a barrel roll before. I needed something to make me feel better so reached in my bag for a Rusty Harding Carthage. One toss and it came back right into my hands. Time to leave the field and go back to work. 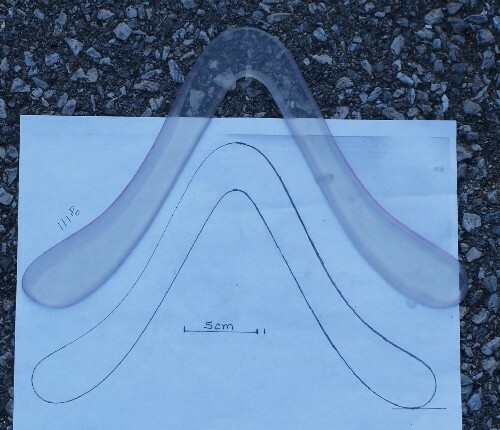 I got a request from a Brazilian boomerang maker to cut him some boomerang shapes out of 3/16 inch thick polycarbonate. He wanted to try making some longer range boomerangs from this material but did not have access to it. Well I have loads of it and in exchange for a couple boomerangs I am cutting him those blanks. I know I could just send him the material but shipping to Brazil is expensive and shipping only the blanks will reduce the weight and cost. As you can see I hae 8 blanks all ready to go. Since cutting these he has emailed me several more plans so I still need to cut more. It looks like I’ll have another 6 ready to ship by the weekend.